Saturday, September 16 from 10:00 a.m. until 6:00 p.m. Explore an array of Japanese ramen styles at the autumn edition of the JAPANFes Street Ramen Contest. 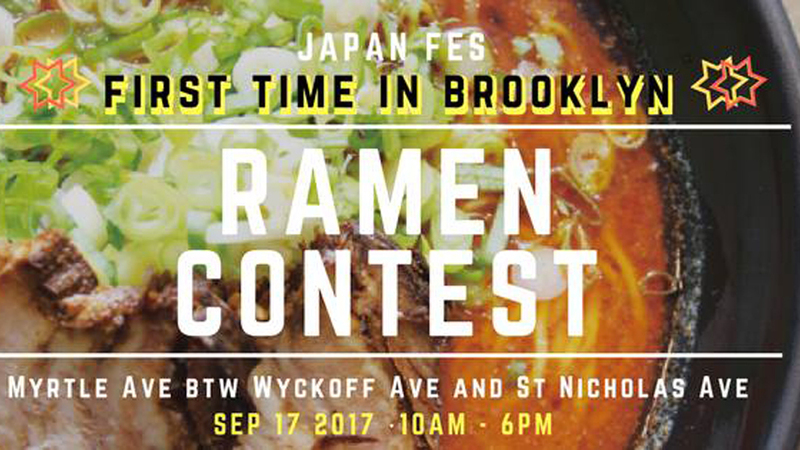 This tasting extravaganza features 15 types of ramen by shops based in Japan, New York, LA, Boston, and Rhode Island. They will go head-to-head to see who will be crowned the ultimate champion, as voted on by JAPANFes attendees. Wuhao New York will sell tenugui, the Japanese traditional cloth; Mizudama will have a selection of children’s clothing; and Wingbot will have kawaii products. At 2:00 p.m. there will be live music by Kohei and TiA, a Japanese recoding artist who sings the end theme of NARUTO. They will host a “Miss Red” contest and dance party featuring J-pop songs and a free photoshoot. Wear any type of red clothing – formal or casual – to JAPANFes and receive one free Calpico drink. To enter, sign up at Performance Stage by 2:00 p.m. A lucky winner will receive a grand prize of three free ramen and free tickets to J-Anime Night on October 27 and 28! Previous Previous post: Learn Classical Japanese Dance!